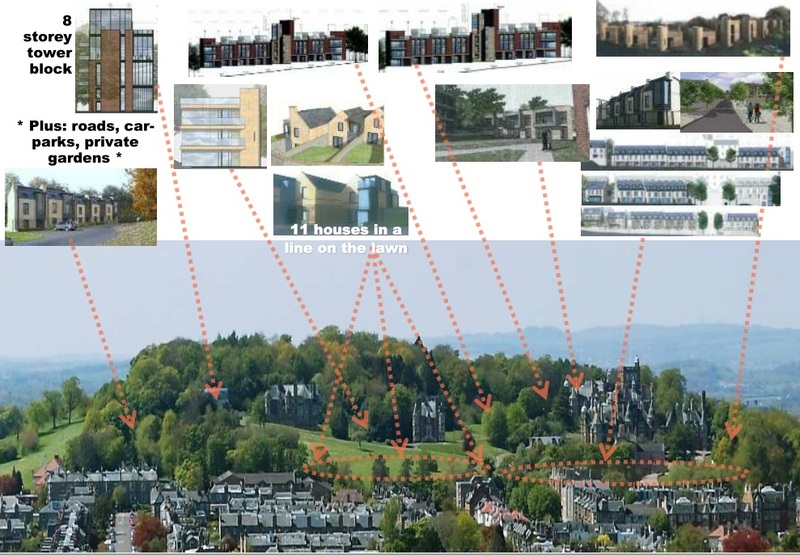 We have quickly produced a diagram of the proposals, based on the view from Blackford Hill. This angle gives an easy to understand view of the impact of these proposals. We are working on more diagrams to show the proposals from different angles. Click in the image to view it full size. Shocking how much development has been applied for. The only positive is that it’s so against the local plan and local opinion that there is hope it will be rejected if enough people – locals and politicians – make their opinions known. Despite overwhelming local opinion against excessive new build the Developers have now actually increased the amount of new build they intend/want to do. Does local opinion/the Local Plan not count for anything? It makes a farce out of having a Local Plan. What is their justification for an increase in new build? The massive amount of build they want to do, including the uprooting of mature trees and height and position of some of the buildings will ruin the skyline and this stunning site.